Ce programme est provisoire et peut être modifié sans préavis. 11:00-11:30 : Jorge Nuno Silva, "George Berkeley's Ludus Algebraicus"
11:30-12:00 : Alda Carvalho, João P. Neto, Carlos Santos, Jorge Nuno Silva, "History of Nim Games"
14:00-14:30 : Anne-Elizabeth Vaturi, "Fragments of a game of 58 Holes among the Pratt ivories in the Metropolitan Museum of Art (New York)"
14:30-15:00 : Claudia-Maria Behling, "Games involving nuts as a topos for childhood in Late Antiquity and pre-Christian time"
15:00-15:30 : Marko Jankovic, "Board game accessories in Roman graves of Moesia Superior (more or less present Serbia)"
15:45-16:15 : Mark A. Hall & Katherine Forsyth, "On the compatibility of Gaelic ‘Fidcheall’ and its P–Celtic cognates with the Roman introduction of Tafl-like games to the British Isles"
16:15-16:45 : Mark A. Hall, "Black to move: a look at some jet chess pieces from Britain"
16:45-17:15 : Ulrich Schädler, "Le plateau de jeu d'Autun : romain ou Renaissance ?" 9:30-10:00 : Tristan Cazenave, Abdallah Saffidine, "Monte-Carlo Hex"
10:00-10:30 : Fabien Teytaud, "The Game of Havannah: nice challenge for computers"
10:45-11:15 : Jean Mehat, Tristan Cazenave, "Ary, a general game playing program"
11:15-11:45 : Olivier Teytaud, "The Game of Go: recent progress for an old game"
11:45-12:15 : Tristan Cazenave, Nicolas Jouandeau, "Towards deadlock free Sokoban"
14:00-14:30 : Michel Boutin, "Les jeux de pions en France dans les années 1900 et leurs liens avec les jeux étrangers. L’invention d’un jeu singulier : l’Attaque"
14:30-15:00 : Edward Copisarow, "Chronologies using British 19th-century Intellectual Property records: Ludo, Agon and Reversi"
15:00-15:30 : Gadi Kfir, "Hunting for Board Games in Poland"
16:00-16:30 : Fred Horn, "Lost treasures: hidden gems of abstract/strategic board games within the pages of Games & Puzzles nos 1-77 (1972-80)"
16:30-17:00 : Tom Werneck, "The impact of the Award ‘Spiel des Jahres’ on the Development of the Market for Board Games in Germany"
9:30-10:00 : David H. Caldwell & Mark A. Hall, "What do we really know about the Lewis chessmen?" 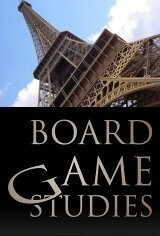 10:00-10:30 : Phil Winkelman, "A∂ elta stelpur: an Icelandic chimera"
10:45-11:15 : Thierry Depaulis, "Three early 17th-century printed board games by the Veuve Petit in Paris"
11:15-11:45 : Phillippa Plock & Adrian Seville, "The Rothschild Collection of printed board games at Waddesdon Manor"
11:45-12:15 : Bruce Whitehill, "‘The Checkered Game of Life, 1860 – Milton Bradley’s First Game"
Les Groupes 1 et 3 quittent le FIAP à 14:00 ; le Groupe 2 quitte le FIAP à 15:00. 9:30-10:00 : Alex de Voogt, "The archaeology and anthropology of Syrian mancala"
10:00-10:30 : Peter Michaelsen, "Haretavl - hare and hounds as a board game"
10:45-11:15 : Piotr Adamczyk, "Short history of board games in Poland (from around 1st cent. A.D. till 17th cent.)" 11:45-12:15 : Paul Lequesne, "Des contes et des jeux"
14:00-14:30 : David Parlett, "What’s it all about? – Abstraction and representationalism in games"
14:30-15:00 : Michel Van Langendonckt, "Vers une typologie des interactions sociales dans les jeux de pions"
15:00-15:30 : Michele B. King, "From gangsta’ to gamester: an entertainment-education strategy for a school-based gang prevention program"
15:30-16:00 : Dores Ferreira, Pedro Palhares, Jorge Nuno Silva, "The ability to play games and its connection with pattern recognition"
16:45-17:15 : Carlota Dias, Jorge Nuno Silva, Pedro Palhares, "Mathematical Games for the Blind"
17:15-17:45 : Manouk Borzakian, "Pistes pour une approche géographique des jeux de plateau"